You are here: Home / EU - Regulating Biking / Motorcyclists are Vulnerable? 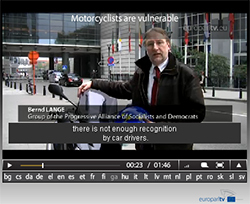 MEP biker Bernd Lange (Germany) – raising the awareness of dangers faced by his fellow riders – around 50% of accidents are caused by the fact that there is not enough recognition by car drivers – who need to be educated to have better cooperation with motorbikes. Malcolm Harbour MEP (UK) – regarding key causes of accidents and poor road infrastructure – the relatively inexpensive investment in changes to the layout and marking of dangerous junctions you can actually can make a real difference. ADAC (German car club) wants ABS on bikes with a “plucked from the air” hypothesis that ABS will save 5000 motorcyclists from dying – just what the EU Commission wants everybody to hear….